Gavin’s work promotes the notion of stepping back in order to see things. He points out that we should notice the people that shape our lives more. That we should notice the rise of the digital – and the implications this has on our society and lives. Gavin Rain was born in Cape Town on 23 March 1971. He studied Art and Neuropsychology at the University of Cape Town in the 80’s and 90’s. 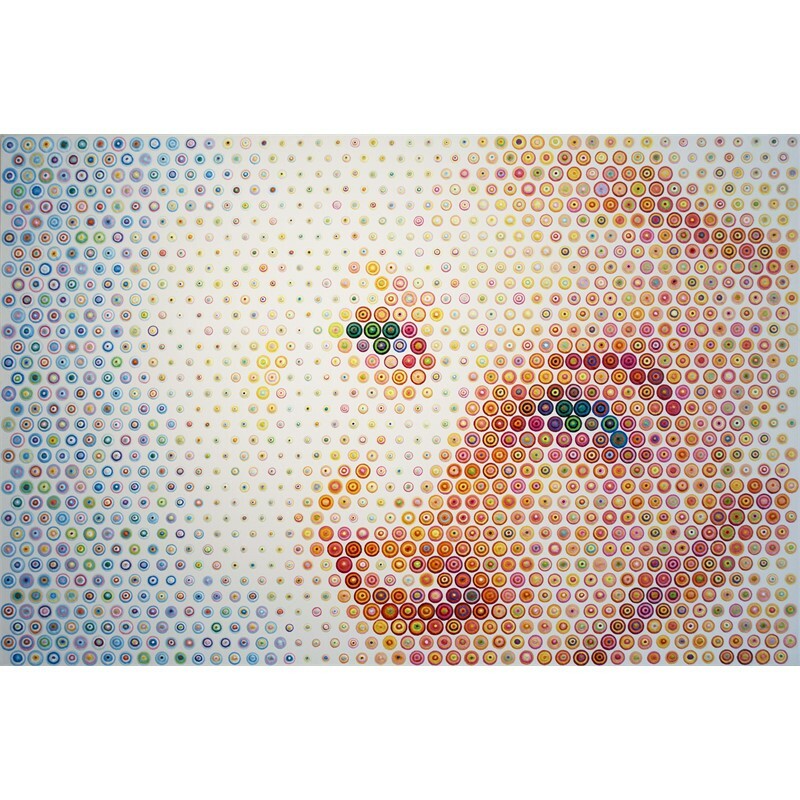 Rain has been painting his whole live, but started with pointillism around 2003/2004. He is influenced by Seurat, Russian avant garde art of the 1900’s and many architects. Earlier in his live, he planned to study architecture, to try and combine his two interests: art and mathematics. In 2011, Rain participated in the 54th Venice Biennale, in the Republic of Costa Rica pavilion with an original portrait of Nobel Peace Prize winner Aung San Suu Kyi. In 2013, he presented in the Republic of Bangladesh pavilion with a work entitled ‘Lena’. Rain’s objective is to broaden people’s visual and cognitive horizons by showing them the fantastic and impossible. 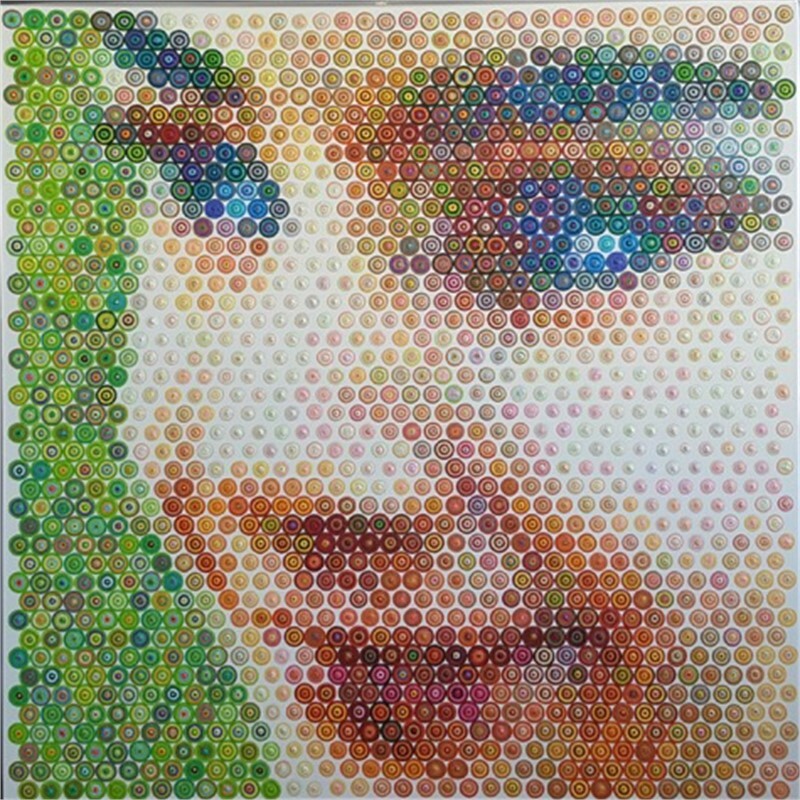 By combining his origins, his studies, aptitudes and personal talent, Rain has invented an art that is both unique and participative so that all who look at one of his paintings can perceive the convergence of two opposing pictorial styles: the abstractness of the multitude of colorful concentric circles that thicken into dense and imperfect dots in relief, and the figurative aspect of the image that is defined by the sum of these same dots as the viewer takes a few steps back. It is precisely in this backing-off that the artist’s intended message lies: in order to acquire awareness of something that is concealed yet right in front of your eyes, or hidden in plain sight, you must distance yourself by moving backwards. His art is a clear invitation to ‘back off’, to create some distance in life as well, because as Gestalt psychology sustains, the whole is greater than the sum of the parts. We must view the big picture, the whole, without worrying about isolated events or individual points of view. 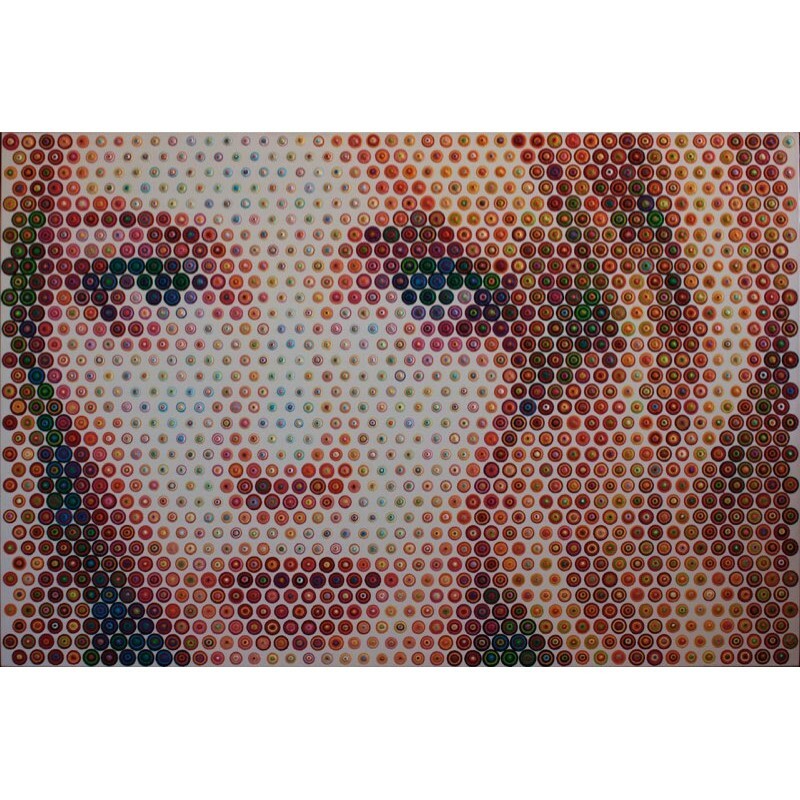 Up close, Rain’s paintings consist of small concentric dots painted in different colors of acrylic paint. From a distance your eye puts these colors together into one. The further the viewer steps back, the more clear the portrait becomes. of this list, he picks the combination that creates the color he wants. Another important part of the technique is changing each dot size. The white canvas Rain uses as a background means that the smaller the dot, the more white background around it. So the bigger the dots, the darker an area gets and the smaller the dots, the lighter the area becomes. 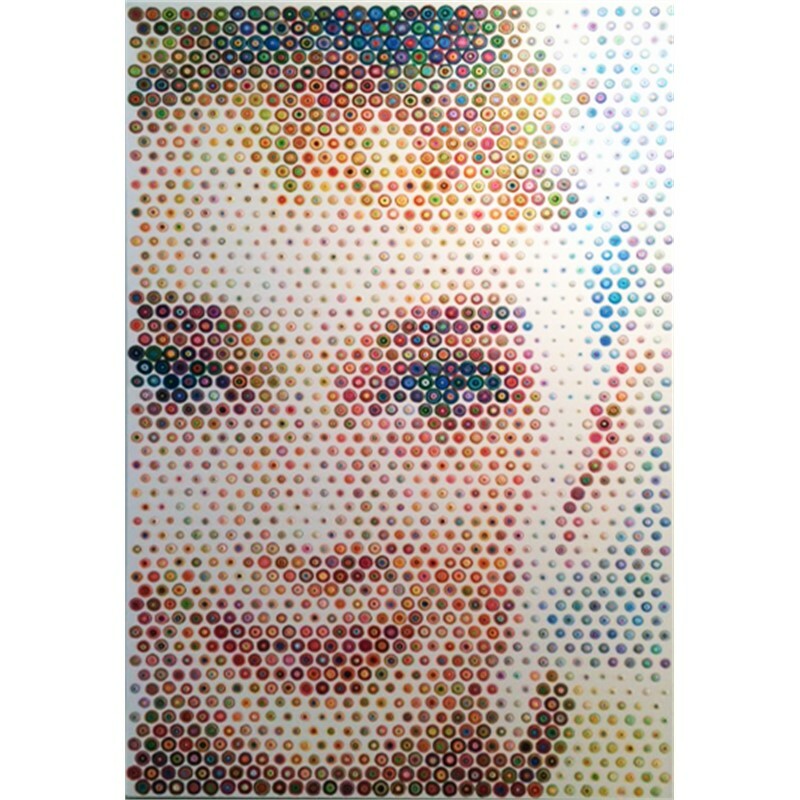 This, combined with the distant final color each dot makes is how the image is created. However, the colors of separate dots will merge together into a new color as well. So, it's not just each dot but also a combination of dots that makes the color. Gavin’s work promotes the notion of stepping back in order to see things. He points out that we should notice the people that shape our lives more. That we should notice the rise of the digital – and the implications this has on our society and lives. Gavin Rain was born in Cape Town on 23 March 1971. He studied Art and Neuropsychology at the University of Cape Town in the 80’s and 90’s. 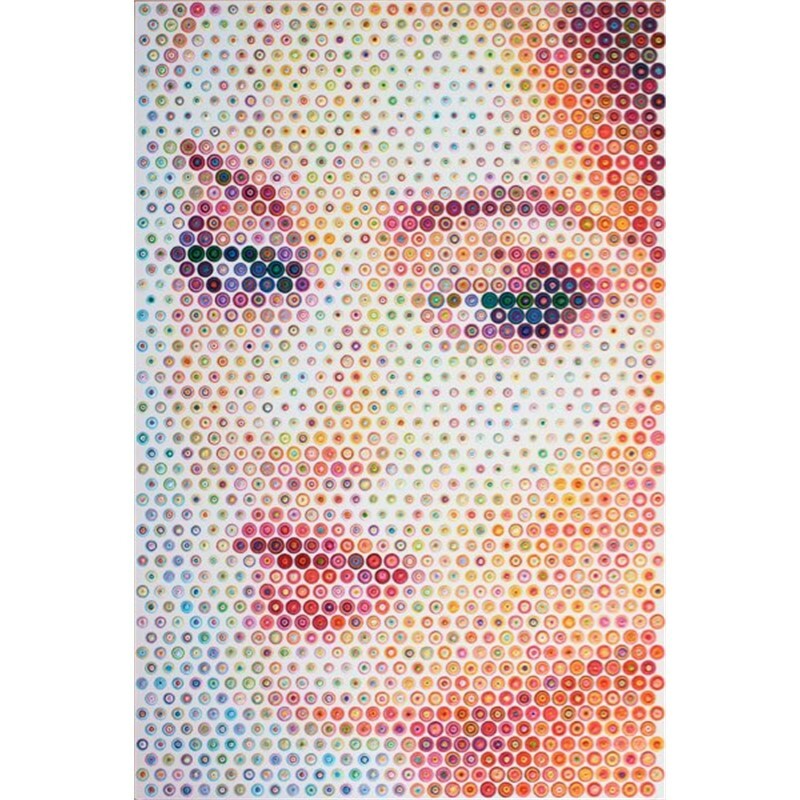 Rain has been painting his whole live, but started with pointillism around 2003/2004. He is influenced by Seurat, Russian avant garde art of the 1900’s and many architects. Earlier in his live, he planned to study architecture, to try and combine his two interests: art and mathematics. In 2011, Rain participated in the 54th Venice Biennale, in the Republic of Costa Rica pavilion with an original portrait of Nobel Peace Prize winner Aung San Suu Kyi. In 2013, he presented in the Republic of Bangladesh pavilion with a work entitled ‘Lena’. Message: Rain’s objective is to broaden people’s visual and cognitive horizons by showing them the fantastic and impossible. 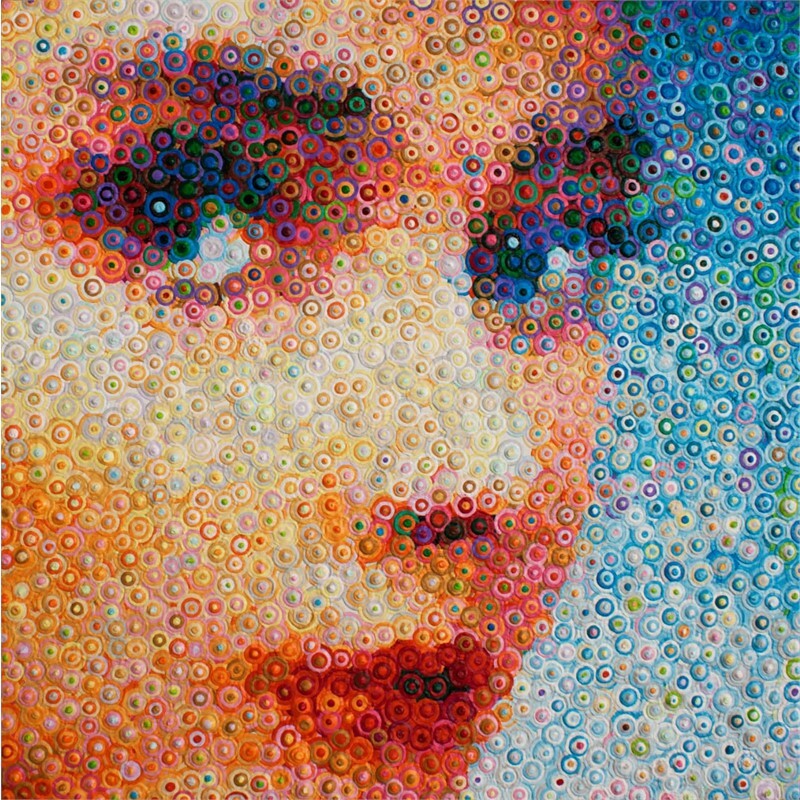 By combining his origins, his studies, aptitudes and personal talent, Rain has invented an art that is both unique and participative so that all who look at one of his paintings can perceive the convergence of two opposing pictorial styles: the abstractness of the multitude of colorful concentric circles that thicken into dense and imperfect dots in relief, and the figurative aspect of the image that is defined by the sum of these same dots as the viewer takes a few steps back. It is precisely in this backing-off that the artist’s intended message lies: in order to acquire awareness of something that is concealed yet right in front of your eyes, or hidden in plain sight, you must distance yourself by moving backwards. His art is a clear invitation to ‘back off’, to create some distance in life as well, because as Gestalt psychology sustains, the whole is greater than the sum of the parts. We must view the big picture, the whole, without worrying about isolated events or individual points of view. 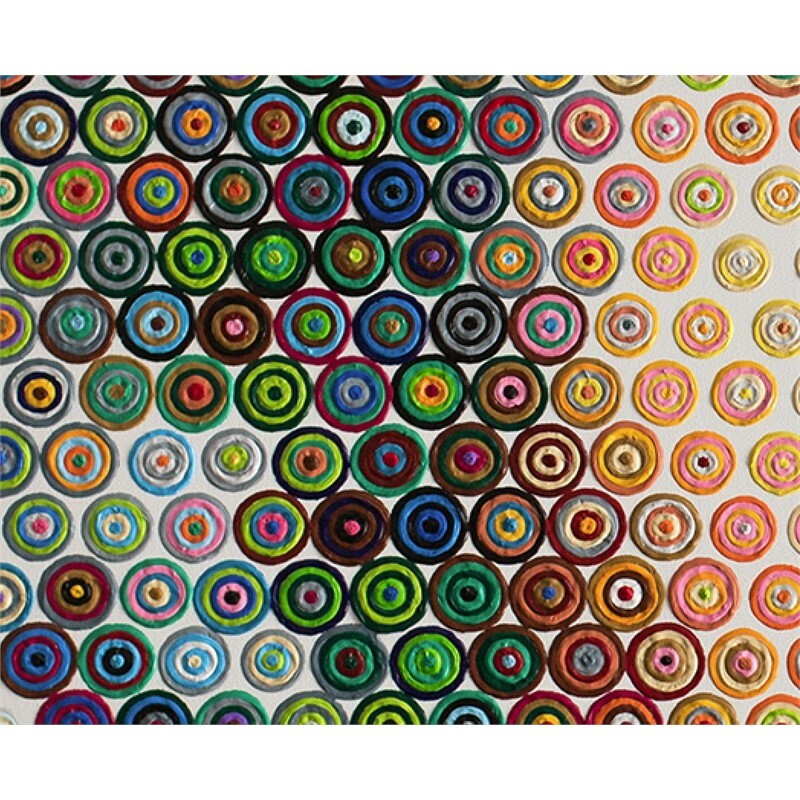 Technique: Up close, Rain’s paintings consist of small concentric dots painted in different colors of acrylic paint. From a distance your eye puts these colors together into one. The further the viewer steps back, the more clear the portrait becomes. He starts his paintings by making a sketch of the portrait he wants to paint. 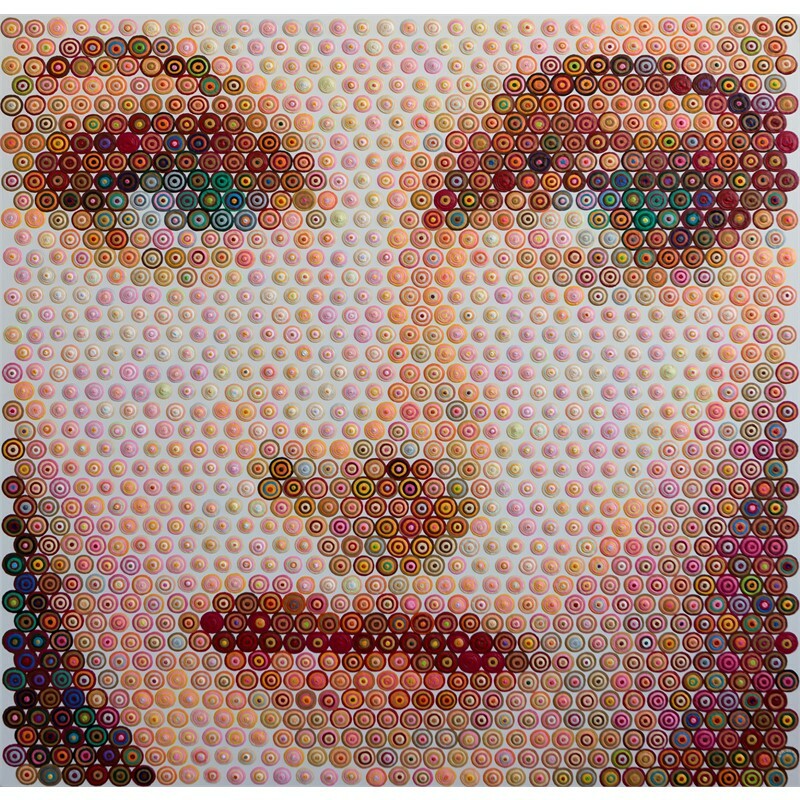 To decide the place of the dots on the canvas, he either uses a grid, made of strings, or projection. The grid takes about ten hours to make, but is more accurate then using projection, so Rain still uses both techniques. 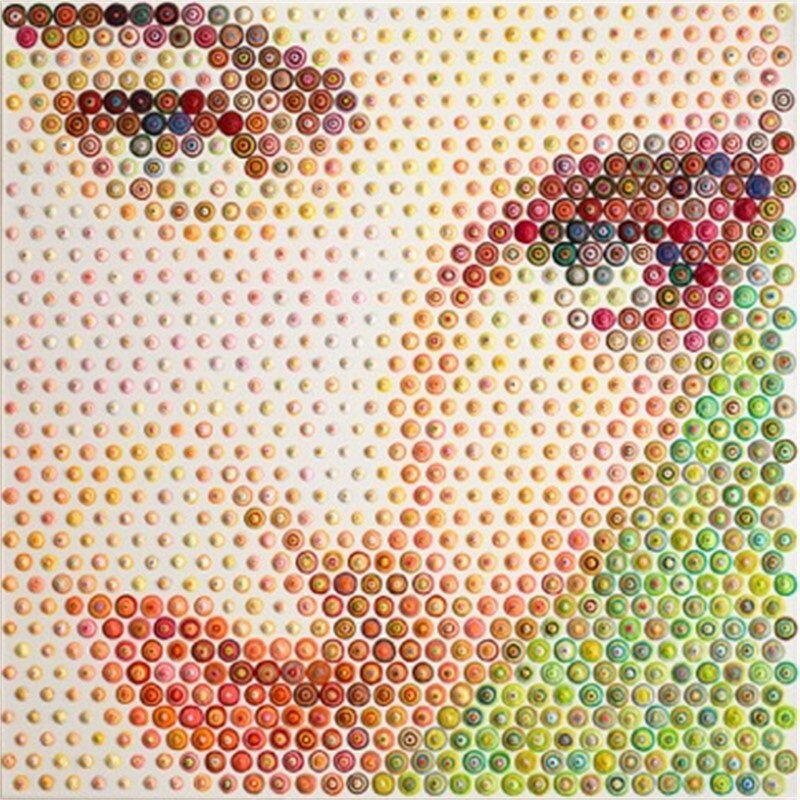 Then he picks the colors for the final dots. He starts by deciding the final color that he wants a dot to be and starts working backwards. Rain has a list of 14.000 different dots that he has made. Out of this list, he picks the combination that creates the color he wants. Another important part of the technique is changing each dot size. The white canvas Rain uses as a background means that the smaller the dot, the more white background around it. So the bigger the dots, the darker an area gets and the smaller the dots, the lighter the area becomes. This, combined with the distant final color each dot makes is how the image is created. However, the colors of separate dots will merge together into a new color as well. So, it's not just each dot but also a combination of dots that makes the color.